March 27,2015: Werewolves, anti-alien riots, and the science of it all gets discussed after Lunair returns from her kidnapping - Roy still missing. The HMSS Starfire is quiet, Starfire is standing in the 'lounge room' that typically is open to just casual gatherings with a glass dome opened to view the galaxy they hover within, a clear view of the stars and earth below, but now the glass is being used as an open monitor relay, touch screen and motion detective, but 3D projected as well to display a large digital embodiment hologram of a werewolf, transparent enough to see the physiology while screens scroll data that K'tten had found on mythology and current date activities. Much like aliens a lot of it is suspect, and not soundproof hard evidence of reality or origins. On another screen is news articles on worldly uprisings of more hate groups, riots, and hunts for aliens leading to many mutant/meta/human maimings and deaths. Long flame red hair is pitched to one side, up and over to cascade down one shoulder and over her figure, strands hanging bed-raggled in her face as she spins the life sized and life-realistic model of the werewolf for inspection. "Princess," he greets gravely. Then he hrms at the high-tech displays, finding a seat to watch what Kori is doing quietly. Starfire notes Skaar's entry, a flicker of pupilless gaze his way then back to the projections of 3D screens and data scrolling. For now the hologram projection of the werewolf is left standing there in the middle of the room. "You can say my name, Skaar. I think it is kind of pointless to call be by a title granted by a planet no longer in existence." There is no bitterness in her words, in fact she seems tired and solemn, but what about this entire situation is not draining? This is her home, she's sweared to protect a place that would assume kill her and her friends out of fear, when they have protected them from what they should truly be afraid of. A warriors mentality will never understand that of sheep. Something once said to her…and years later she gets it. "No mountains for you today, hm?" "Koriand'r," says Skaar, accepting the correction without protest. It happens Kori fits very well to the idea Sakaarians have of what a princess should be, so the title comes naturally to him. "I came looking for Luna," he explains, "but she is not here either". He was going to ask K'tten to find her, but now he wants to know what Starfire is doing. "Maybe with the mutants?" Kori inquires while slowing down to scroll through a page about werewolves and recent sightings, as well as blurry cell-phone snapshots of assumed creatures of Luna. Her hand drops and from the wall of words to Skaar once more she finally settles. "In doing research on the creatures that attacked us as well at that anti-alien mob they are said to react to the moon, mainly the full one, which I can research down to the magnetic and polarities, but how it tugs at the genetic makeup of a supposed 'disease' that is blood borne and becomes ingrained… Beyond me. Thankfully it seems to only be able to override lower gene scales in infection. Since I am fully blooded Tamaranean with a hardened physiology more advanced then human, any damages are not contagious to me - or you. Our bodies shun it as easy as a sneeze." Lunair's - had a rough night. That's a polite way to put it. It'll be a night and the better part of the next day before she wakes up, rather groggy and likely confused. She usually lets the others know if she's visiting her mutant peeps or somewhere, but not this time. How odd. Where even is she? It'll take her a moment to even orient. This end up. Then, she frantically pats her pockets, hoping she has her things, that precious communicator. Patpat. If she finds it, she'll use it. "Hello…?" What even happened? Her head aches and reels, a few images and memories floating through. "Maybe," grunts Skaar. But Lunair is not answering to his calls, so he is not sure. Usually he wouldn't worry, but with Hydra trying to capture her, he prefers to have the young woman located all the time. As for the werewolves, Skaar looks skeptic. "Supposed to be supernatural, cursed beings. They didn't fit the 'mythic' description, they knew what they were doing and in broad daylight." He should have grabbed one of them, but he wasn't thinking during the fight. Who would know? Maybe a magician? Or could Jericho, or Roy, find out something from their contacts. 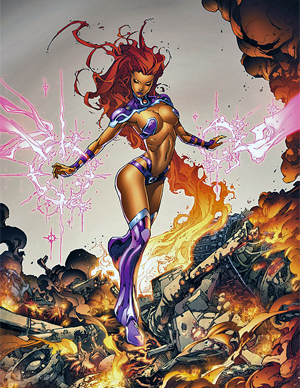 "Speak of the Luna.." Starfire says as that voice rings over the comms, though not as crisp as it usually is. K'tten does not need gestured or told, the communicator and the voice is recognized and compatible, the location homed in on and Lunair is one second on the streets, the next in the ship, flickering into full figure in seconds. "Yes, well, everything is based off theories, we just need to seek the truth. That only comes from the source and even then it can vary based on sources." A slow shrug as those eyes travel from Skaar to Luna, a red brow slowly taking a hike up her forehead. And teleporting while woogie? Lunair's stomach just about does a backflip. Apparently Skaar is not the only one with a green face here for a moment. The world tilts a moment before Lunair blinks blearily at the two. She smiles weakly at them. "Hi." Yes, there you go. She's glad to see them, but she's further out in orbit than the international space station or Charlie Sheen on Saturdays. With a grunt, she picks herself up slowly. Her head is foggy as all heck. "…" "How are you?" Skaar turns to see Lunair teleporting in, and stands to catch her when she stumbles. "You look ill," he mentions, "have you been fighting?" He carries her to the closest chair and studies the state of her outfit for a few instants. Hmm. A glance to Kori, then he stands at Lunair's side, waiting. Kori is beside them both in a quick stride, exchanging a look with Skaar and then speaking to K'tten. "Get Orn out here with food and water for Lunair, a paper bag, and something to cuddle…" Looking at Skaar. "Something /soft/ to cuddle." The look of concern is evident in the small crease of brow as she steps aside and gestures for Luna and Skaar to take over the large chaise couch in the middle of the room/observatory. A sweep of hands up and out and all of the data scatters from 3D projections to placement upon the glass and walls. Lunair would totally be down to cuddle a Skaar. She really would. But there's a confused look at the question. "Um. I did fight." There was a lady with a purse… "Someone had their purse stolen…" And … and.. Okay, she recalls them fighting. "Then the lady went full librarian ninja…" The rest gets kinda blurry, really. "And a giant robodog. I'm not sure. I got grabbed and shaken." She recounts what she saw, though she likely didn't see Taskmaster. But! Giant robodog! "I woke up a little, it gets kinda strange. There was a lab…" Then, her head hurts a bit. And she leans against Skaar. "Thank you." She really does appreciate it. "Thanks…" This to Kori and the others, too. She rubs the back of her head. Skaar almost perpetual frown deepens at Lunair's words. Librarian ninja and robodog… that sounds quite on the Luna-talk side of narrative logic. Unless they are supervillain names, that possibility is always present. He turns to Kori, "can we know where she has been in the last few hours? I think she is drugged." K'tten is already tracing Lunair's steps back in the past 12 hours, where there was movement and where there was none. Considering her state it looks as if she is suffering the effects if being sedated, or knocked the hell out, both of which is gathered from her murmurings. Orn comes from the kitchen, a tray in his hand and wearing a far more fuzzy frown upon his face then Skaar. Things, needless to say, have been tense lately. Soup, toast, water. All goes down easy and after sedation a liquid diet is the safest for the shade of green she is sporting. Skaar is rubbing off on her?? Since the mainframes computer is wired to the projections Kori had been cycling through it shows the blip, a reading of Lunairs vitals and locations on a panned out map of the Tri Cities. When it pauses for more then an hour and readings slow to levels of possible sedation Kori grips the spans her fingers, a magical appearing gesture that is all science, honing in on an abandoned warehouse. "Do you remember there?" Kori asks Lunair. Lunair looks worried about the others. And maybe he is. Green is good, though, right? Lunair pauses. "I don't know the dog's name but I guess Roy shouted Baroness or something. There's a lot of those in Europe, though." Right? Right. She's not sure. Maybe Roy was off? "Thank you," She looks grateful to Orn, even if her expressions are a bit odd. Lunair blinks and looks to the magical appearing warehouse. She shakes her head. "I think I got knocked out when the giant robotdogcat thingy grabbed and shook me." Like a frenzied 6 year old being allowed to play with maracas for the first time. "Sorry." "We should look for Roy," notes Skaar, looking at Kori. Because if Lunair is here and in this poor state, Roy might be even worse. There is a curious glance to the map the computers are forming, is that where Hydra is hiding now? He makes a mental note. "You can tell us later," he says to Lunair. There is a rigid stillness in Kori when Lun mentions Roy being there as well. A slow blink and lips part, inhale. Exhale. The hard part to miss is those arms hanging stiffly at her sides and contorting with the hardening flex of sinew. "Where's Roy?" The question is hard trained to not waver, to remain solid all the while emerald gaze narrows at the warehouse location. If she could blow it up with a look, she would. But what if he is still there? "Did you see? 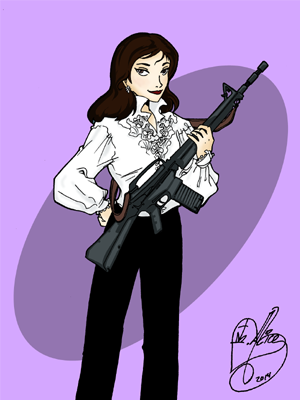 Is there anything you can remember… Baroness…" K'tten is on it already, digging as deep as she can, though Jericho would be a /lovely/ aid in hacking government systems, be they US or international. "Eat and rest Luna. Please." Before the big angry Tamaranean offers to /spoon/ feed you by force! "Roy was at Centennial park fishing, he ran to help the purse lady with us." Lunair recalls. "I think he got hit in the head with something," She isn't entirely sure. Though, she smiles at Skaar. "Thanks." She looks duly grateful. Lunair looks worried by Starfire's reaction. "See?" Headtilt. "Well, not much after the doggy got me." It was not in fact, a nice doggy. Not in the slightest. The whole thing is foggy, achey and Lunair's brain is stamping its feet. "Okay," She'll eat. Eating and talking at the same time would be a bad idea for this human. Skaar drags a (large) chair to settle at Lunair's side and watches her eating with a worried expression. Although he can't see injuries, she should see a healer. A human one, because K'tten and Dapalo don't inspire a lot of confidence when trying to fix living beings. This means he needs one of the other human Outsiders. "What about Jericho or Nancy, are they available?" He asks Kori quietly. "Dog, like… That?" Star points to the projection of the 3D werewolf, the only thing she suspected of being able to pick up Lunair and bring her into unconsciousness. Was it another hate attack was her concern, or something new all together that Jericho had brought to their attention. This HYDRA? "We can try and reach Jericho, we need him for more then one thing it seems." Though the more Lunair talks about her memories the more Starfire is tensing, lifting her communicator and trying to call Roy with no answer. The perse glow that comes to her fingers melts it. A light curse and she drops the bubbling piece of metal, plastic and wires only to catch the one K'tten lobs at her head without a flinch. "I should ground you." Mumurs the mohawked Tamaranean before she goes back to researching, the screens flipping and opening new pages in her hunt. "You're here now, that is what matters." Lunair smiles at Skaar. She is grateful he's there. She works on eating a little. "Kinda," But it was totally a robodog. "I am okay with talking to them." Then a blink at the communicator that gets melted. Her eyes widen a little. "Me? Oh, sorry." She isn't sure she wants to be grounded, but she would go with it. She doesn't feel like roaming around a whole lot right now anyway. "Thank you guys…" Sluuurp. Seems they have to wait to find Roy, he recognized the attackers. This means they are not the anti-alien people. But would Hydra have released Lunair after drugging her? Skaar is getting too angry to think straight, so he watches Luna eating and babbling in silence for a few minutes. "At least you don't look injured, are you tired?" he asks. Starfire uses the new comm and is still trying to reach Jericho… Roy. Healer? They have one and Reese's comm unit will buzz. It will only wait for an answer, not a yes or no. Kori is not in the mood, so if Reese answers, even if she was mid shower, she's beamed in. Sorry. Politeness in urgency is moot for Starfire and her patience is on a thin wire. "We need to make sure there is nothing wrong beyond my own capabilities of help, and we need someone here for Roy when he gets back." Those final words stiffening her upper lip, yes she is sure of it, and there is a very important reason that is making cookies with Orn right now. Starfire also likely wont be able to adopt for 8 more years because this government hates aliens right now. Their turn! There were way too many things that Reese has to carry now a days; a pendant, some weird box that was given to her by Hal, in which she shakes and he's at her side in a flash. That was weird. And the pager from Starfire. She doesn't have to shake that. Usually she'd press some weird button or talk into it and she's back on what she would like to envision as a 'tugboat', because living in denial was the best way to go. But she was there, holding onto the pager type thingy, standing in the middle of the room with Max at her side, her face scrunched up in a bit of worry as she begins to shake the pager like so. "How." Lunair is a little out of it to really be worried, but she's picking up on the tension around her and looks confused. She reaches over to gently set a hand on Skaar's shoulder. "I am. But I - thank you." She's glad for his concern. She's genuinely touched by those concerned around her. There's a blink, as Reese arriving. "Hi!" She is really touched, just loopy. So loopy. Is that a toucan? Hmm, not really froot loopy. Not yet. Skaar might be a little worried and tense. But that is actually a nice change from his usual angry and arrogant. Give him time, he is not used to care about anyone. Reese arrival is a distraction, so alright. Not that she knows much about her. He peers are the newcomer. "Reese… hmm, Lunair here was beaten and drugged. She needs some help." And no one has told him about Reese powers, so… "do you know any human doctor we can take her to?" Starfire approaches Reese then, a hand lowering and extending to the large dog, palm out in greeting that gets a wet and slobbered tongue to coat fingers. Yuck, but she copes, smiling in a strained manner but at least there's that. Although, her hand rises and the webbing of saliva stretches between fingers, her nose wrinkling. "I do not like the habits you are picking up.." She says to Max, and only gets a wag of tail in response. "Oh." She was here. It was getting harder and harder to tell when she came and when she went.. oh well! "Hi Lunair!" And then a step, Skaar's words taken into consideration but saying nothing. Now that she's thought about it, only one person had seen her powers in effect, but it was all for a show, the lights in Metropolis to make the children and their parents safe, warm, and happy. "Oooh.." She says to Skaar and Lunair, the woman of many words holding her hand out for /someone/ to take to lead her towards Lunair. "This.. may seem weird. But do not attack. Alright?" She says of them all, Max himself was used to the way Reese operates, though now a days.. she was starting to become a little reckless. "Who is the other who needs healing?" Lunair looks to Skaar. She adores him, even with the grumpy. She is a bit dazed. "Thank you," She offers to Reese. "How are you?" She is sipping her soup, pausing. "I wouldn't attack," Lunair promises. She's pretty sure she wouldn't. The tension in the air is making her worry a bit, "And eerm, sorry. I really should've just -" What should she have done? Definitely not flop. The Art of Magikarp is not an effective fighting tactic, tragically. "I think Roy, once we scoop him up. He got bonked over the head." "Roy. Maybe." Replies Skaar, warily looking at whatever Reese is doing. "Lunair was attacked, again… perhaps Hydra. Roy was with her and now he is not responding to his communicator, so he might be injured." And those are a lot of words for the usually silent green-skinned barbarian. Hey, at least he is not melting K'tten's gadgets. "By now I think you would know better of me." Starfire states to Reese, taking her handand guiding her to Lunair, that pupilless green gaze landing upon Skaar, knowing his protectiveness, and feeling the palpable tension similar to her own. It's a promise, a silent one from her to him that Lun would be okay. "When Metropolis went dark, I did a light show to try and liven the worry up for the people. My own, and fireworks. She sang, and did her own performance. One that lifted the spirits and then some - immeasurably." In saying as much she released Reese's hand and stepped back. "I know better, but they do not." Reese states plainly. She's only talked to Lunair and received food from her, which.. of course she'd like to keep that going, so of course she'd help! Skaar, is another matter entirely. While she was not bothered by the man, but the direction of his voice puts him as a size /tall/. Large? Subjective. As Starfire lets her go, she reaches out to lightly try to touch Lunair's forehead, swiping away the bit of hair as both hands rest upon her cheeks. "Stay still." Is all she instructs, her thumbs toying along the bottom of Lunair's lips, full of soup or not.. It may look like a kiss! But it was something out of a science fiction magazine, Reese's own lips part, a thin blue glow slowly builds within the back of her mouth, collecting mana and magic, the essenses of Reese's soul, the path soon breathed out and into Lunair to revitalize and invigor. It could have a weird effect on the people she gives this gift to, many suffer with a caffeine like high without the horrible side effects of missing sleep. It was like Reese's very own battle cry up close and personal. It erases the fog, the poison..
Once, someone actually headbutted her by accident cause they were ready to go! She doesn't stop there, Lunair was beaten, so her hands begin to glow as well, pushing her healing energies to create a wave of calm and relaxation as the muscles and dermis enter in the motions of remaking themselves anew. Think of it as a momentary high! Clear state of mind, and all of that jazz. Lunair smiles. "That's really sweet," The light show and everything. "I dunno, she had more a snake theme than a HYDRA thing. There's too many evil reptiles," One eye closes unhappily. She's touched by those who worry about her, at least. Lunair likes to help Reese. She really does. She's even remembered to pick up a netbook somewhere for her. And Lunair blinks, a couple of thumbs on her lips. Lunair looks puzzled. AWhaaaaaaaa. And then, Lunair's mind is totally blown. Boggle. Boggle. She doesn't have a whole lot of time to think about it, but holy noodles. The kiss of life indeed. "Umwow." Okay, wow. Just wow. She's pretty stunned by it all. Stare. "Thankyou." Currently seated on one of Orm's chairs, Skaar is not that tall. At least by hearing measurements. Someone should bring Reese up to date on the other Outsiders. And Skaar too, because he didn't know what Reese could do. An inquiring glance is directed to Koriand'r. Singing and fireworks, really? Or… apparently not. Did something happen? Lunair seems about as dazed and stunned as a moment ago, blue light and all. "You alright?" He asks, addressing both women. What better time to know the abilities then when they are needed? Before and in meetings it would only be a waste or without proof. The show does bring a small smile to her lips, looking down and then away as a fresh and revitalizing breath of life is given to Lunair. Hovering around the community or lounge room is the projection of digital screens, ones that right now hover over the dome glass that opens over the cosmos they hover within, a 3D model of a werewolf standing in the middle of the room while a breakdown has been formulated of its physiology as well as pages of mythos, superstition, and recent images of 'suspects'. Kori was doing research with K'tten when this all came about. Roy still unfound so Starfire is trying to call on them all for help is solving this mess. Jericho does have this odd habit of slipping off sensors entirely at times, but he's not generally hard to get ahold of if you know how. K'tten does. And so it is that Jericho comes out onto the bridge from the main teleportation chambers in the back, in black T-shirt and cargo pants. He doesn't need to hide his traces here (HYDRA not super likely to try assassinating him here) so he does not. "Hey Kori. K'tten's request sounded urgent. Woah, you alright Lunair?" Jericho echoes Skaar's question, nodding to the big green man. Reese he doesn't know, but she's on Kori's ship and Kori isn't objecting so all's likely well. Reese smiles, though it seemed a little faint, her hands slowly drawing away from Lunair's cheeks to keep them back and parted.. the blue glow slowly remaining upon her fingers as she draws them down to try to shake it off. Shake shake shake. It wasn't too hard to control, but she found herself losing a handle due to too much use.. "You're welcome Lunair!" Reese says cheerily, taking slow and careful steps back to slowly sink herself to the ground, putting on a stalwart face as Max whines, seeing through the facade of his charge. That big pitbull lumbers towards Reese to flop into her lap, taking up most of the room, his size nearly overpowering. A head is lightly jerked in Skaar's direction, but she remains quiet and tight lipped. Lunair is fine! And woah.. there's a ..somewhat new person? She remembers that voice. But, she couldn't really place him. Lunair warned them. She did. She said don't google furries. But no one listened. Nope. Still, Lunair nods after a moment. "Yes, thank you. I appreciate it." She's surprised, but much better. The healing is new to her. Boggle. She waves to Jericho. "Hi there. And yeah, better now." She's unaware of the long term effects, but that's probably for the better. She finishes the stuff brought to her, awing a little at the dog. Doggeh! "Are you okay?" She peers at Reese. Shakeshake? Is that usual? She has no idea. Skaar leans back, still looking at Lunair and trying to figure out if she is back to normal. Jericho arrival pulls him back to the troublesome situation. "Lunair and Roy were attacked, he is still missing," he explains the hacker. Vague gesture to the computer simulations and searches going on. Werewolves, Hydra and that Baroness, all together and it is not clear if remotely related. And don't ask about the furries. Starfire nods to what Skaar says to Jericho, deep purple lips thin as she did not have to fill it in, all the while K'tten is stuck on a page about what all Baroness' go through in their lives from small girls to teens. Etiquette school, debutants classes, and if you go back to the 1800's… "If I had to go through this as a child I would be violent as well." But in Tamaranean culture as a child you were learning war, so… Yeah figure it out. "I am trying to find out /who/ Baroness is, not what /a/ baroness is. I cannot access some areas I may need to." A glimpse from Jericho to Starfire and then back. Reese's condition has Starfire going to the kitchen herself, checking on Orn and Lian, and returning with more food and water for both Reese and Max. Tension may be easing a bit, but that does not stop worry. "Hrm. May I?" Jericho always asks before linking to the Starfire's systems. It's polite. Plus he's fairly sure that K'tten could make life very difficult for him if she wanted. A moment later his traces light up and he's surrounded by two concentric cylinders of transparent blue light, with multiple windows and readouts in each one. The empty space between is filled with cascading ones and zeroes and in the background a small but noticeable silhouette that looks a lot like K'nert moves. The hacker manipulates data with looks and gestures, opening new windows, closing old ones out, moving some about as he checks and cross checks infiltrated HYDRA networks with his own experiences and information on the general 'net. "The Baroness… ah yes, I've heard of this one. HYDRA affiliate. High level one too." Several pictures flash up. Nothing ever certain. All of the images are either poor quality or of someone in concealing, protective clothing. "Some think it's a code name. Others insist that she's some kind of Euro noble. But the name's associated with terror operations across a decade. Dangerous person and definitely HYDRA. Wish I could give you more but there are networks that even I haven't penetrated yet." Reese just gives a little nod in Lunair's direction, a slight smile pressing upon her lips. "I'm just fine. It's just getting harder.." Maybe she was doing it too much, perhaps it was the bit of darkness that was left inside of her with the stab, the not so healed wound that was covered by the pendant gifted to her. She even touches it a little, then shifts back upon the floor so that Max could keep her warm throughout. If the other person was Lian's father.. no. She didn't need to worry about herself tonight. "What if we send Max out to find Roy?" Reese asks the room, gaze lifting around even though she sees nothing and no one, but she does smell the food that was near to her, which was reached for and rested upon the side of Max so that they both could share. Jericho's assessment of The Baroness draws a faint frown to her lips. This was something that she'd likely stay out of, but would be here for them if they needed her. Lunair is still quiet for a bit. She tilts her head at Reese. "Well… take care of yourself, okay?" She seems concerned. She looks to Skaar. She seems reasonably normal, at least, physically. The whole thing has left her a little uncertain. The tension in the air is rubbing off on her, and she's - happy to have Skaar near her. "She was really good at running in heels, and mentioned debutant stuff." Freaking well mannered, heel running ninja nobles, man. She falls quiet again. "He was in the park near the hedge maze, I thought. Unless he got up and wandered off…" At least it was Metropolis and not Gotham, where Roy would probably be found without pants or something. That's it. It was Hydra, and they let Lunair go after… something they did. Skaar growls and stands. He is heading out, but before leaving the 'lounge' he approaches to Kori. "We need to check that warehouse, and find out what they did, let me know when." A last glance to Lunair, and he is out. Jericho's words and the scroll of data are unsure, but there's enough evidence. Just like how she had read, werewolves were assumed mythology until they were seen, snapshots of them not just attacking but saving people. Suspect, assumptions, and there is a sliver of truth in every fallacy. Starfire exhales slowly and when Lunair gives the location and Reese offers Max, she nods. "Just in case it is like the attack that breached the hull of our ship, Max may be less suspect. HYDRA knows of us, knows what we look like… Unless…" Pausing Kori moves to where Jericho and K'tten worked, getting the image inducer and waves it. "I can take the dog for a walk." Let's face it, it would give Kori some peace of mind as well if they found Roy safe and sound. "HYDRA certainly knows me." Jericho says dryly. "Well. Some of them do. They don't always talk to one another. And sometimes they fight. So it's never certain, dealing with them." About the only thing that Jericho knows for sure is that they're about control and are ruthless in getting it. "Sounds good. If you need help finding Roy I'll keep an eye out. They've been getting aggressive about snatching people." He shuts his traces down and the light around him fades. His eyes go from K'tten to Kori to Reese to Lunair. "Were you guys looking into werewolves for some reason?" Reese lifts the plate of food from Max's side, giving a slight pat to his haunches, snapping her fingers and pointing towards Starfire's direction so that he could go to heel. Lunair was smiled at.. or at least where she thinks she was, a slight nod given as she draws herself to a stand, taking a few steps forward with a searching hand to rest the food upon Lunair's bunk. "I will." She was tired, after that little stint, her back at a clear hunch as she feels along her back pocket to retrieve her walking stick. With no Max around, the stick will be her eyes, right to her bunk so that she could rest until Roy is found. HYDRA.. werewolves.. her own problems thrown into the mix, yet.. there was a little fear that placated her features as she draws in a breath. She did.. at the end of the day, needed help. She was tired of running. These people.. even the new guy who spoke, were her family. Reese suddenly blinks out of existence. She looks to Jericho. "There were some who attacked us at some anti-alien protest," She explains. Lunair smiles back. "Okay." She does worry about Reese. And then suddenly, Reese poofs. Thankfully, she didn't explode, but. Some hours later the bridge is empty but for Jericho who is once again standing in twin columns of light. Symbols swirl around him. Images. Data. He's searching. Looking. He's headed back to Limbo soon but there's no rush just yet. Lunair's likely napped on and off, wandered around the ship, maybe even eaten a bit. She even makes sure to look for Skaar and the others. But for now, worrying about gathering presents is set aside. "Oh hey!" There's a wave to Jericho. Jericho turns and waves, surrounded by data. "Hey Lunair. Can't sleep?" Does he ever sleep? Well yes. The question is where. And if you don't know that he's not telling. Does it involve cuddling with a plushie computer and a binary onesie? Lunair is curious, and perhaps a bit concerned, but she's not gonna pry too much into Jericho's comings and goings. He's got internet powers, so it probably involves a hefty loss of SAN points. Lunair nods at him. "Yeah. My head feels kinda weird," She admits. "I hate not knowing what happened. How about you?" "Information is my bread and butter." In those columns of light around Jericho there's a shadow that's vaguely imp shaped, moving about, pointing out bits of code and manipulating them. "So not knowing what's going on is not a nice feeling for me either. What happened in the park?" "I see," Lunair kinda figured such. Although, the shadow has her curious, and she's watching the code a moment. Huh. She thinks a moment, furrowing her eyebrows intently. "Well, I was checking out the hedge maze. I heard some lady scream. Her purse was being stolen by some dude, so myself, Metal and Roy went to help. I mean, it's not too hard to tackle a guy and get a purse back, right?" She considers. And really, it's the nice thing to do. "Except it turns out the lady was this Baroness ninja librarian chick and she starts shooting a cobra laser beam or something. Really starts letting poor Metal have it. There was a creepy ninja guy bothering Roy - he was the thief, and I guess it was a ruse." She stops a moment. "Someone bonked Roy over the head at some point and there was a giant robodog. It grabbed me and knocked me out." She rubs her head. She lets him interject or ask questions. Jericho quirks an eyebrow. "Giant Robodog? Lovely. I think we were lucky to get you back in one piece. Did you let Medical check you out? Just in case they, you know, did anything to you? I know you don't particularly like doctors." Makes sense really. "But I'd hate for you to be tracked." Nod. Lunair will describe it, if Jericho's ever seen RAVAGE. "I guess. She didn't want me dead. She didn't even tell creepy grandpa guy," She considers. "And we're waiting on medical. Orn took a look and Miss Reese healed me. I woke up in a lab briefly, and I think I saw Taskmaster, but it's all fuzzy." She was drugged to heck and back. "I can go away if I'm being tracked. And yeah…" Lunair seems less than thrilled about the idea of a doctor. "Starfire was really nice about it, everyone was. So-" Fidget. Pause. Headtilt. "Do you know anyone else's eyes who glow amber like that?" Lunair kind of peers at him, one eyebrow lifted, the other lowered. "So I rested, and they went to look for Roy. I think they left him behind, but at least it was in Metropolis. If it were Gotham, he'd probably be found naked or something," Lunair remarks. Maybe even naked and propped up on cement blocks. "It's all really fuzzy, and honestly, I wonder if that's the end of them trying to grab me. I didn't think Hydra liked cobras." She is so confused. "There's some links to HYDRA and Cobra." Jericho says as he lets the datastream fade and his traces stop glowing. His eyes don't though. "They do fight sometimes though. Much of HYDRA does on occasion." He shrugs at the question about his eyes. "No, I don't. But mine didn't glow until comparatively recently." Nor were they amber. Lunair may remember, when they first met near a year ago his eyes were grey with amber flecks. Now there's no grey to be seen. Lunair looks thoughtful at that. The whole thing is confusing to her. She sighs softly. Then she peers at him. She does remember that. A little nod. "I see. The person who started the fire at the protest, his eyes glowed amber a moment," She recalls. "That was why I asked. I mean, it's cool and all. But it seems pretty rare." While she could have glowing goggles or some sort of holographic effect… well. Still not glow-eyes. Jericho cants his head, curious. "Is that so? I'll have to see if there's any footage of him. See if I can dig him up." Glowing eyes, particularly amber glowing eyes, are indeed not something someone sees every day. "I'll look into it. Mine… mmm… started glowing when certain things changed around me. Maybe about me. I'm not quite sure." Which is not quite true. He knows why they glow in generalities if not specifics. Lunair nods. "Yup. I thought it was really odd," She admits. "Well, I won't pry too much. It's your glow. I mean, I get curious but it's probably none of my business." She considers. "I figure it has to do with your internet powers." Yes. Lunair simply accepts it. "It's just you, you know?" Just something in the qualia of Jericho. "Sooooomthing, like that…" Jericho smiles. Really, has to do with more… essential alterations in his basic nature. He doesn't quibble on the matter though. "I'm glad you approve though. It does make it a bit harder to blend in. I have to rock the… what was his name? Oh, the Cyclops look sometimes." Sunglasses. Not red lensed though. He actually gets away with a surprising amount without them though being as they glow with his emotions and not everything provokes an emotional response. "So how are you holding up? Getting snatched at is… rough." "So. Mysterious." Lunair ponders this. She shrugs and smiles. Lunair just goes with it. It's part of Jericho as she knows him, and that's that. Starfire's eyes glow, too, after all. "Yeah, Cyclops. And I see. That makes sense, though." Especially these days with anti-everyone groups or whatever kicking around. Lunair accepts the glowy Jericho eyes. Lunair goes quiet. "I feel strange. Worried, everyone is worried and I feel kind of bad about that." She seems quieter at the question. "Kind of betrayed after we helped the purse lady. I can't even remember what happened. And that bugs me." She rubs at her face. "But I slept, and it's hard to sit still." "Do you play any instruments?" It seems like a random question but Jericho has moved over to one of the Starfire's consoles and is tapping at it thoughtfully. It doesn't look like he's sorting data. It looks like he's accessing the bridge holo-array. The one used for projecting star-system readouts. Or would be if this thing had a working Star Drive. His question makes her pause. Lunair blinks, then shakes her head. "I mean, I am scared. But it's hard to-" Handgestures. She doesn't really express emotion terribly well. Metal's theory may be more correct than he knows. Either way, she seems puzzled. "Why do you ask? Do you?" Does he play keyboards? Use a vocaloid, maybe? She watches him and the glowy bits a moment. The holoemitters project a baby grand and Jericho sits down near it on the empty bridge and plays a little jazzy tune. He's got a better in Limbo. Illyana… well she made a whole music room for him and he prefers to play there these days but really he's just showing Lunair. "This is how I relax when I can't sleep or when I'm restless. Play a bit. Read a book. Cook something. No reason to let it eat at you." He's a pianist! Lunair seems a little surprised. She smiles, nodding. She doesn't know about Limbo, or if she does, it's only vague hints and shadows. She gets curious, but seems reluctant to genuinely pry. Even if it would be r-e-a-l-l-y interesting. Nevertheless, she tilts her head a bit. "Neat! And I see. Yeah… I guess not. I mostly want to just run over a bunch of HYDRA but I'm not in any shape to till my head clears," She sighs. "Hmm. I'm pretty good at cooking." A shrug. "I was going to bring your laptop and a karaoke machine for Starfire. Is that a good or bad idea?" Ponder. "If you do, better prepare her for the internet." Because to the uninitiated the Internet is as strange and frightening a place as any alternate dimension. Jericho smiles a little. "Cook eh? And you mentioned you do botany too. What do you like to cook?" "Well, the laptop was for you. I -" Yeah. Lunair shakes her head. "After the furry mishap, I don't know…" She doesn't know so much. Even Lunair, who uses it sometimes to work on figuring things out or read on social mannerisms… well. She smiles back and nods. "I do. And hmm. I usually do Japanese food. I sometimes do other stuff. I've really started. I am majoring in botany, but to be honest, I was fighting for a normal life then. Now? It's mostly because I just wanna." Shrug. Jericho's computer is mostly in his head, truth be told. However laptops have their uses. "Sure. Laptop'd be fine and Karaoke… well. I'd be interested to see if Kori sings, truth be told." He can play. As he is now demonstrating. "Just want to fight, mmm?" That must be the best and worst power. Internet in your head. But Lunair nods. "She does sing along to her music sometimes," Lunair remarks. She says, "You play really well." He does! She's well mannered! "And sometimes. Er, I mean, taking the botany because I want to. The more I tried to be all normal, the more hapless people got caught up in stuff. I just kinda guess it's a part of life now. Does that seem odd?" "It can be hard to get away from." Jericho nods. He really is quite good. Near professional levels honestly. He's done this to put food on the table before. "Well, no odder than my life. The important thing to remember is that we're all pretty normal where it counts. Need for friends. Need to be able to trust people." Says one of the most paranoid people Lunair knows. Lunair doesn't think it odd he's so cautious. She tends to be more easy going because life is a lot simpler when you can conjure someone's pants full of explosives on demand. That, and she really does like people. Call it catching up after years of missing out. "Yeah." She inclines her head a little. "That's true." Lunair thinks of Jericho as a friend, after all. "Although, I bet sometimes the Pianoman song must drive you nuts." Sort of like retail workers get sick of the jokes about things not scanning being free or whatever. "Do you do stuff like cooking?" She knows he does internet stuff. And he plays piano. And he seems to have interesting friends. And has a glowing werewolf form. "Cook, fix cars, bartend, street magic. I've done a little bit of everything." Jericho smiles. "Helps put food on the table when you're running from HYDRA and can't have a bank account that you didn't steal from one of their hitmen. Or set up as an anonymous numbered Swiss deal." He does indeed tend to glow. Though his forms have altered over time, much like his eyes. "And it does sometimes. You'd be surprised how many bars like it though." "I see, that's a lot." Lunair nods and smiles back. That makes sense. She is fortunate to come into wealth through her own ways, perhaps. "It sounds like you've been through a lot," She ponders this a moment. To someone who's spent most of their days in a lab or a single room, it's a bit awe-inducing. "I - guess I would. I'm not really allowed in there," She remarks. Alas, poor underaged Lunair. She'll get there. Lunair is thinking. "What's your favorite one to play?" "Still young, that's right." Jericho does forget sometimes. Lunair doesn't act like a typical 19 year old. "I like the jazzy songs. They relax me. Ones with no words." Like one he's playing now. The Wind and the Wolf, by Keiko Matsui, if she knows it. "I have. I've been around for a bit and spent a good chunk of it fighting." And lets not go into how time runs differently in Limbo. If he thought about it, and he hasn't, he's probably put an extra year or so on there alone. She isn't one. But neither is he a typical dude. It evens out in the end. Lunair smiles. "I see." She doesn't seem to know the song, but it's nice and she appreciates it quietly. "I'd ask how long a bit is, but I guess if you can't ask girls, you can't ask guys," She taps a finger to her chin. Is that how it works? To Lunair, 7 years feels like eternity! But she doesn't seem aware of Limbo or its timey wimey stuff. It's something for Jericho. She only knows Illyana in passing, after all. "So instrumental stuff is your favorite," She recounts. "Interesting." She hadn't really thought about it. "Well, I sing too. But not as much. I'm okay but I'm better with the keys here." He grins. "Besides when I do it for work singing's often not part of the job." People want some background noise while they meet or eat or drink or what have you. "I'm nearly thirty two, in case you're wondering. In May." Seems like it's sneaking up for certain. "Long enough to know that eleven years of fighting is a long time." "I see." Lunair smiles at his grin. "That is pretty cool," She nods. Live music has a charm to it that's difficult to replicate, too. She pauses as he admits his age. Eyes him a moment. Kind of closes one eye, much like one does when surveying a math problem or drawing. Hmm. Hmhmhmhmhmhmhm. Hmmmmmmmmmm. "Really? I'll have to think of something for your birthday. Do you celebrate them? I thought you were in your 20s or something," She admits. But it might not be shocking she's mistaken. "That is awhile," She concedes. What does Jericho do with his birthday time anyway? "I'm in good shape." The hacker grins, winking. It's nice that she thought that really. "We'll see what's going on when my birthday comes up. May be that I'm otherwise engaged." Fighting, for himself or others. He gets into it often enough to be sure. "But I appreciate the thought." At the grin and wink, Lunair smiles. "Fair enough." She really did think that. "And that's a good idea." Lunair may be around, she might have a car land on her or something. Who knows? "I'm glad. I bet Starfire and the others would, too." She looks distant a moment. "I might go get something to eat. Did you want anything?" She might be giving him a little space, too. Lunair does add, "They did find the abandoned warehouse where I was likely taken, so … I think it's in the computer stuff." She hushes promptly.